Vinyl records are making a huge comeback, and the Crosley C100A is the perfect turntable for enjoying your new, 180 g vinyl releases, or bringing your vintage record collection back to life. 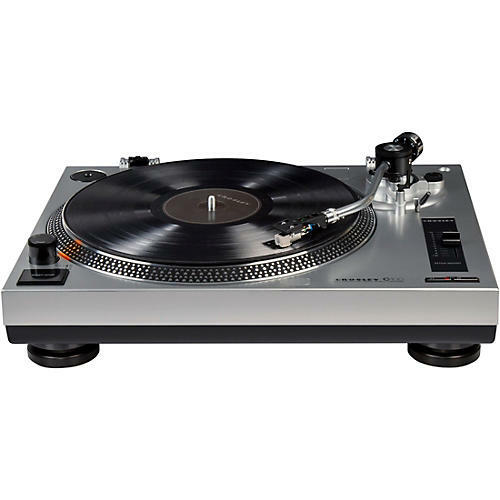 Styled after a professional DJ turntable, this reliable, belt-driven record player features an adjustable counterweight, adjustable pitch control and your choice of 33 RPM and 45 RPM playback speeds. Fine tune your platter's speed and keep an eye on slippage with the convenient strobe light. The C100A's curved, s-shaped tonearm helps keep the needle in the groove and resists skating issues. This ensures your albums sound the way they're supposed to, and your vinyl doesn't get unnecessarily worn out or scratched. In order to deliver good, accurate sound, a turntable needs to have a solid foundation. That's why the Crosley C100A features high-tech ABS construction. Giving the C100A a modern feel, a translucent dust cover easily pivots open to allow quick access to controls, and closes to protect your record from wandering hands. The C100A belt-drive turntable is ready to play, right out of the box, thanks in large part to its built-in pre-amp. Simply connect the record player to your powered speakers or home stereo via RCA connections and you're in business.